In a tragic incident, type II joint government quarters were damaged in a devastating fire that broke out at around 11.45 AM at Chongkham on Thursday. The quarters belonged to Chow Nantiya Namchoom, Teacher of Govt Hr. Sec School and D.N. Upadhaya, Agricultural Field Supervisor. There has been no report of any casualty as at the time fire broke out the families were said to be not present in the quarters. Fire tenders from Namsai and Tezu rushed to spot and doused the fire before it spread further. The cause of fire is not known. 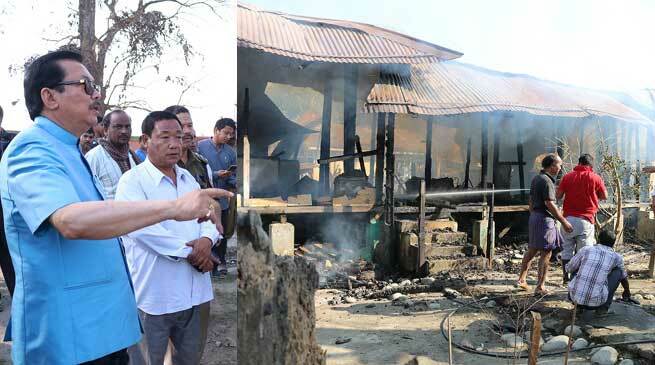 Deputy Chief Minister Chowna Mein and Parliamentary Secretary Forest & Environment Chow Tewa Mein took stock of the extensive damage caused by the devastating blaze. As an immediate relief to the affected families, Parliamentary Secretary Env & Forest Chow Tewa Mein provided cash amount to the victims and assured for all possible helps.